We gave this squirrel proof feeder to my father-in-law for his backyard and it really works. It's expensive but effective. The squirrels still pick up the seeds the birds scatter on the ground, which could be a negative for a terrace. The scattering, I mean, not the picking up. Isn't it amazing how word gets around once you have a feeder? Thanks for the link. I actually don't mind the squirrel, and once I swung the arm away from the planters it seems far enough away for him/her not to jump on. 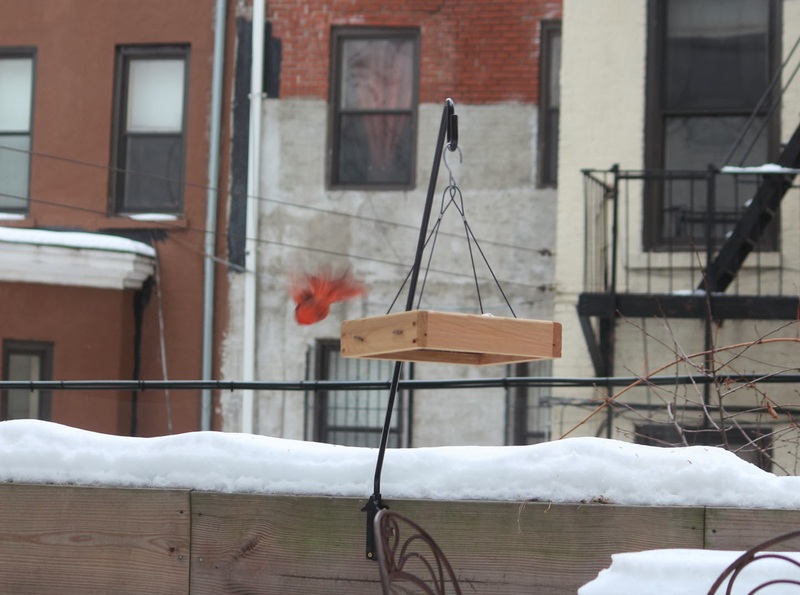 We have a squirrel-proof feeder handing from one of our trees and on the rare occasion we get snow or ices the squirrel's put on quite a show trying to get to the bird seed. It was Storbie who alerted me. He was in the far room on the street side of the house and suddenly dashed to the closed French doors to the bedroom, and lashed his tail wildly. So I opened, and he charged to the door to the terrace and sat there, chattering. Which he never does. WTH? I looked out and saw the squirrel. I really don't know how he saw it from so far away and through the curtains. For Molly and Lucy, this is kitty television. The kitty chirping happens here on a regular basis mostly for the birds rather than the squirrels. The raccoons that have wandered by in the evening get the hairy eyeball. I'm glad my kitties are not outside kitties. We've lots of squirrels in the backyard, but none that dark. Is it the lighting or is it a different species in the squirrel family? No, this one is quite black. I see quite a lot of black "grey" squirrels. A genetic mutation, I assume. 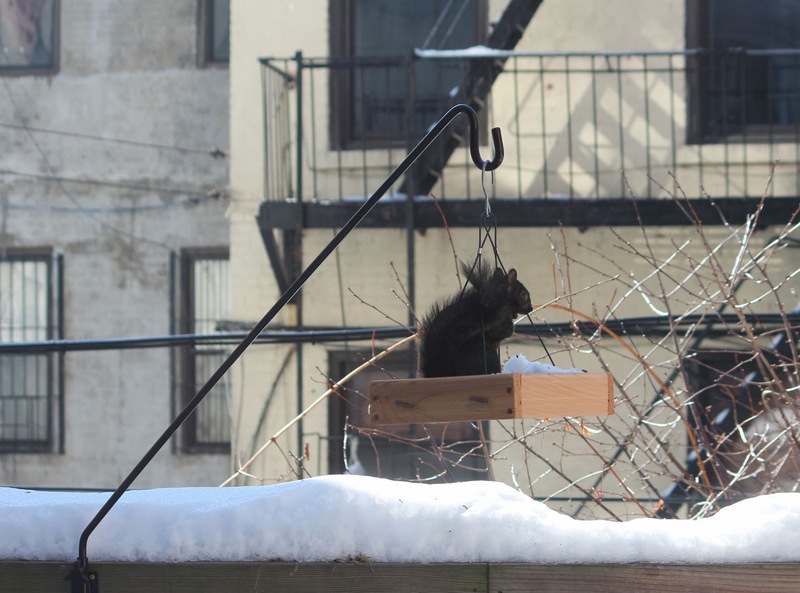 We have many more black squirrels than grays here in Toronto. I think they are some sort of a subgroup of gray squirrels. The thing about squirrels, I have found, is that they will not stop eating as long as there are seeds remaining in the feeder, which also has the effect of keeping birds away. For this reason, I like my bird feeders squirrel-proof (difficult thing to come by) and feed squirrels in the winter on occasion with something else (such as winter squash seeds dried in the oven) on the ground. Comments left 4 days or later after a post's publish-date will be moderated (purely for spam control). Please be patient, you will be seen! Text & photos © 2007 - 2019 Marie Viljoen. We have art, Nietzsche said, so that we shall not be destroyed by the truth. "Everyone is so happy on social media. It’s depressing." "I think the past is best left bleeding by the roadside, don't you agree?" How will we know it's us without our past? ...How'll it be not to know what land's outside the door? How if you wake up in the night and know - and know the willow tree's not there? Can you live without the willow tree? Well, no, you can't. The willow tree is you. John Steinbeck, The Grapes of Wrath. Necessity knows no magic formulae - they are all left to chance. If a love is to be unforgettable, fortuities must immediately start fluttering down to it like birds to Francis of Assissi's shoulders. I equate happiness with contentment, and contentment with complacency, and complacency with impending disaster. Afterwards in the street, she looks around the neighborhood. "Yes, it is certified now." She refers to a phenomenon of moviegoing which I have called certification. Nowadays when a person lives somewhere, in a neighborhood, the place is not certified for him. More than likely he will live there sadly and the emptiness which is inside him will expand until it evacuates the entire neighborhood. But if he sees a movie which shows his very neighborhood, it becomes possible for him to live, for a time at least, as a person who is Somewhere and not Anywhere." The garden paths were lit by coloured lamps, as is the custom in Italy, and the supper table was laden with candles and flowers, as is the custom in all countries where they understand how to dress a table, which when properly done is the rarest of all luxuries. One of the new things people began to find out in the last century was that thoughts - just mere thoughts - are as powerful as electric batteries, as good for one as sunlight is, or as bad for one as poison. If we had a keen vision of all that is ordinary in human life, it would be like hearing the grass grow or the squirrel's heart beat, and we should die of that roar which is the other side of silence. "I know it's a great temptation to go mad, but don't go in for it, you wouldn't like it." "A is for dining Alone...and so am I, if a choice must be made between most people I know and myself. This misanthropic attitude is one I am not proud of, but it is firmly there, based on my ever-increasing conviction that sharing food with another human being is an act that should not be indulged in lightly." What he loved in horses was what he loved in men, the blood and the heat of the blood that ran with them. All his reverence and all his fondness and all the leanings of his life were for the ardenthearted and they would always be so and never be otherwise. I was planning on writing about a woman for 50 years. I will never be competent enough to do so, but at some point you have to try. Ek is 'n man met blombehoeftes. "Die kierie kom uit Indonisie, gesny van 'n tak wat van jongs af omslinger was deur a wildevy se rank. Hulle het saam grootgeword, en die rank het sy spoor op die tak gelos. Daarom is die slinger ook oneweredig, en hier,"se hy, "by die punt van die kierie moes daar iets gebeur het - die slinger en die tak het inmekaar gevleg en 'n knoop gemaak. Die natuur het die kierie so gemaak." "n Kieriemaker sou dit eweredig gedoen het," se ek. "My kind," se meneer Boje, "vermy die reguit lyn." Richard Chaston (1620-1695). Chaston wrote that men and fairies both contain within them a faculty of reason and a faculty of magic. In men reason is strong and magic is weak. With fairies it is the other way round: magic comes very naturally to them, but by human standards they are barely sane. No method nor discipline can supersede the necessity of being forever on the alert. What is a course of history or philosophy, or poetry, no matter how well selected, or the best society, or the most admirable routine of life compared with the discipline of looking always at what is to be seen?